Hi, i am much excited to be here. This is my first login and my first time on this page. I am currently building an application to display students exams record from mysql database. The table has been prepared with subjects. 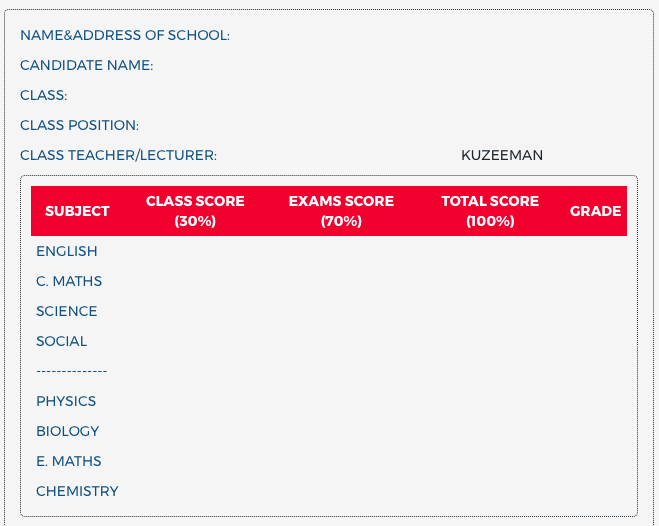 What i need now is how i can display the results of each student when he or she login to the platform. Attached is the table for the results to display from the database. I just need the php script(with any parameters) to display the results. Where's the rest of the data? Where's the name? Address? How about the scores from the other classes? Just write the code with any assumed parameters yourself then i will do the editing. Thanks! I am waiting for your help! Just write the code with any assumed parameters yourself then i will do the editing. Sure. I charge $100 USD hourly, rounded up, with a minimum of four hours. Other things, like transferring ownership to you, may cost more. After we discuss my contract we'll have to work on a requirements document and detail the expected deliverables. There may be more to talk about after that, I won't know until I learn more about what you are hiring me to do. Unless... you were expecting me to do this for free? Because that's not going to happen. I will, however, freely help you make it yourself. But you'll have to start with answering my earlier questions.